The Richard Lugar Lab is fast becoming a topic of household conversation in both Georgia and the Russian Federation, because increasing numbers of people care that it is not a public health facility, as claimed, but a threat to the population and humanity as we know it. The Caucasus region is an ideal location for the United States to outsource its ‘grey zone’ research to. Many of the most ‘attractive’ viruses and bacteria for weaponisation occur naturally in this region, so they can be studied in their natural habitat. The region is also known for its thriving black market economy and trafficking, as the lack of democracy and a civil society makes it easier to hide things from the world. But what is now concerning US officials is the attention Russia is paying to the topic of bio weapons and other related medical programmes. What has been uncovered so far demonstrates that the question is NOT whether the US is in violation of the 1972 Biological Weapons Treaty BUT to what degree. The US has long tried to deflect attention from these programmes. American journalist and Bureau Chief for Veterans Today in Georgia, Jeffrey Silverman, a long time resident of Georgia, is again the cross fire for his articles and series of recent TV interviews, having endured a long series of indignities, and downright illegal acts, at the hands of his own government and embassy. But the new attacks on Silverman coincide with recent revelations in the Russian media. Igor Giorgadze, the former State Security Minister of Georgia, dropped a bombshell in mid September when he leaked documents containing information about “a laboratory located near Tbilisi named after US Senator Richard Lugar”, and how some experiments had turned deadly. Various media groups describe such breaking stories as recurring disinformation, and further claim that there is no factual evidence that the US is building biological laboratories in the Caucasus region in order to use it as a testing site. The same media groups also denied that the US was losing the Vietnam War and declared the well documented CIA human rights abuses in places like Paraguay weren’t happening either. But Giorgadze, a former Georgian State Security Minister, and Silverman beg to differ. They claim that such labs and related medical projects may have secretly conducted experiments on people, some of which have had fatal outcomes. Right or Wrong Person to Ask? Giorgadze has asked Donald Trump to launch an investigation into the experiments conducted by the laboratory. This really has some in Georgia concerned, as Trump is no fan of Big Pharma. He recently stated that the much touted flu shot is the greatest scam in medical history, created by Big Pharma to make money off vulnerable people and make them sick. US-government funded media watchdogs and strong-arm agencies have fought back by using Homeland Security to harass Silverman when he travelled to and from the United States earlier this year, when he was finally allowed to make his first trip home in over 14 years. On both arrival and departure he was subjected to repeated body and bag searches, including seizures of his phone and personal documents, in direct violation of the 4th Amendment to the US Constitution. Such frontal attacks on this journalist date back to when the first stories about the Lugar lab, and the nefarious research linked with it, broke in Georgia in 2013. As he has since backed up many of his allegations with actual documents, there has been a concerted effort to discredit him, not only in Georgia but in the international media. Silverman continues to publish in the Georgian language media, and has described how the concentration camp patients of Nazi Doctor Joseph Mengele can be compared to the civilians residing close to the Lugar laboratory, as they [too] did not understand the threat they were under until they were placed in the medical experiment section death camps—when it was too late. “On paper, the lab is run by the Georgian government, or rather the Ministry of Health. But in reality, it is operated by the American government. The idea is that, if something goes wrong, the Georgian government will take the blame so that the American government can stay under the radar”. The United States has provided a total of USD 350 million for the construction and technical equipping of the laboratory. In 2013 the laboratory was allegedly subordinated to the National Center for Disease Control and Public Health (NCDC), and from 2018 the Government of Georgia will assume responsibility for the full funding and operation of the Lugar center and laboratory network, or so we are told. However it is only the US which has an interest in building such laboratories. Other countries would face sanctions from more powerful neighbours, who can build worse facilities of their own, for doing so. 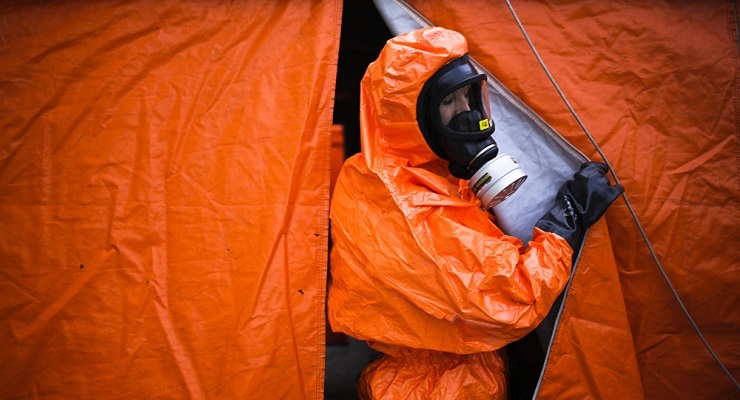 The US wants to flout the Biological Weapons Convention and then claim, if caught, that this is something only dubious, less-developed, “ignorant” countries do, as it usually does when questions are asked in places like Syria and Iraq. The Lugar Laboratory is located not far from Tbilisi International Airport. This means that loading weaponised agents and moving viruses and bacteria around the world is expedited. It is conceivable that the United States may be trying to continue its losing battle in Syria by using biological and chemical weapons, as military planes, which are based at NATO airfields, have been landing at the airport with increasing regularity for no other apparent reason. The same deadly and especially dangerous pathogens could also be targeted, as an aggressive act, against Turkey and the Russian Federation. The US has a history of doing this, and we might recall the Swine Flu outbreak in Russia 12 years ago. Even unsuspecting humans could be weaponized and board civilian fights, just as was described in Station 11, a work of fiction, and how the Georgian flu killed over 95 percent of the world’s population. Emily St. John Mandel’s fourth novel, “Station Eleven,” begins with a spectacular tragedy on a considerably vaster scale arrives in the form of a flu pandemic so lethal that, within weeks, most of the world’s population has been killed. It is standard medical practice that nothing that is injected into the body should be used past its expiration date. But the US military, and other organisations like MARFOREUR, USAMRIID, ClinicalRM, WRAIR, and DTRA, are being accused of giving many such preparations to allied countries as “aid”. They have been widely used on the general population in Georgia, even children, without the victims’ full knowledge and informed consent. When questions are asked, it funnels this aid not through medical bodies but TMC Global Professional Services. This company has overseas offices in nine countries throughout Eastern Europe and Central Asia, and two offices in the US, in Virginia and New Mexico. Most of its work is as a US Government contractor on Defense Threat Reduction Agency (DTRA) programmes, with national laboratories and other DoD customers. For example, it manages an international project at the Chernobyl Nuclear Power Plant site (ChNPP). The Myth Detector claims to have debunked “disinformation” spread around the Hepatitis C elimination programme on several occasions—but it fails to mention the nexus of this programme to TMC. Nor does it give, or investigate, the technical backgrounds of those doing the debunking, who just post pre-written statements provided by their Embassy contacts or PR staff working in the Lugar lab. It is not difficult to expose those actually working in these military projects at the management level. Silverman was once hired by International Crisis Group, ICG, and the French government to look at the links of these researchers. He soon discovered how the Lugar and partner projects are connected to American, European and other scientific centres. All the highly skilled professionals in the TMC office in Georgia left in 2010 to form a new organisation, Sigma. The most high profile of these was Richard Mah, who had worked at Los Alamos. You do not leave the golden handcuffs, and diamond pension, of a USD defence contractor to start a company from scratch unless you feel too compromised to stay with that contractor. But nobody is interviewing Mah, or the main TMC person in Georgia nowadays, Giorgi Begiashvili, before claiming “disinformation”. The US can get away with violations of treaty law because what it addresses has been superceded by new developments and changed beyond recognition. It has often been observed that when a certain narcotic is made illegal, another one comes along which is equally deadly but gets round the laws as written. Claims that any treaty violations are accidental are difficult to disprove because such violations are so widespread as to be unavoidable. Prior to enactment of the Patriot Act, federal law proscribed the use of biological agents or toxins as weapons, in 18 U.S.C. 175. This outlaws possession of a type or quantity of biological agents or toxins that cannot be justified for peaceful purposes. In short, what is being done for the purpose of military use, offensive, is now being justified under the guise of peaceful purposes. Regardless of the ledger of truth and innocence, a public debate has begun which is cross cultural and beyond borders. As a result of it, some of what goes on behind closed doors, under the flimsy disguise of public health protection and non-proliferation of bio weapons and especially dangerous pathogens, is now out in the open. One only needs to look more closely at what has been done in Georgia at various DOD funded labs and medical project. There is a long list to explore, including deaths from experimental TB antibiotics, a succession of dodgy programmes doctors refuse to talk about, and various experimental treatments on what is often an unsuspecting population. If you do not wish to believe Silverman or the Russian media, enough can be gleaned from open sourced academic materials which clearly demonstrate that proper procedures for informed consent are not being implemented. These shine light on what appear to be “backhanders” paid by and to various funding agencies, the UN, the US State Department, Big Pharma and various partner organisations, including the Ministry of Health, various American universities and the Center for Disease Control in Atlanta Georgia. Information is now being shared with the Congressional Oversight Budget Office, about the apparent planting of false and misleading information. However, all this demonstrate is that US-funded disinformation oversight is in fact blatant disinformation itself, as anyone who has lived in a country on which the US has an “official narrative”, such as Georgia, has always known. Not only are some of these new generation bacteria agents and especially dangerous pathogens so evolved that there is no antibiotic or other treatment that can save a patient. Often the cure is only available in the form of bacteriophage preparations, as also is being produced in Tbilisi Georgia on the first floor of Building B at Eliava Institute. Founded in 1923, the Eliava Institute is a world known institution working in the field of Applied Microbiology, Virology and Infectious Immunology. Bacteriophage research and application is its main direction.